India is gearing up for its first ever space undertaking to the Red Planet – the Mars Orbiter Mission, or MOM – which is the brainchild of the Indian Space Research Organization, or ISRO. Among other objectives, MOM will conduct a search for potential signatures of Martian methane – which could stem from either living or non living sources. The historic Mars bound probe also serves as a forerunner to bolder robotic exploration goals. If all goes well India would become only the fourth nation or entity from Earth to survey Mars up close with spacecraft, following the Soviet Union, the United States and the European Space Agency (ESA). The 1,350 kilogram (2,980 pound) orbiter, also known as ‘Mangalyaan’, is slated to blast off as early as Nov. 5 atop the more powerful, extended XL version of India’s highly reliable four stage Polar Satellite Launch Vehicle (PSLV) from a seaside launch pad in Srihanikota, India. MOM is outfitted with an array of five science instru-ments including a multi color imager and a methane gas sniffer to study the Red Planet’s atmosphere, morphology, mineralogy and surface features. Methane on Earth originates from both biological and geological sources. 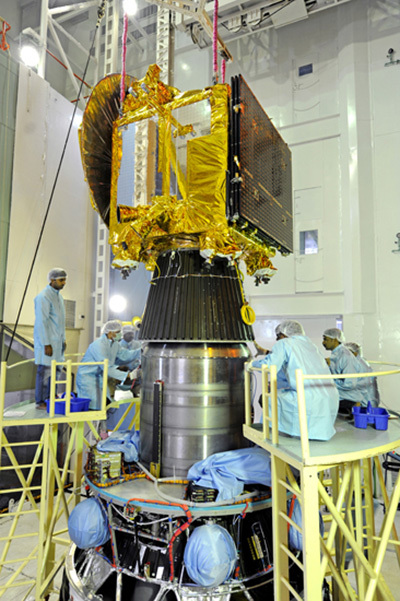 ISRO officials delayed the launch about a week due to poor weather arising from remnants from Tropical Cyclone Phaillin in the South Pacific. 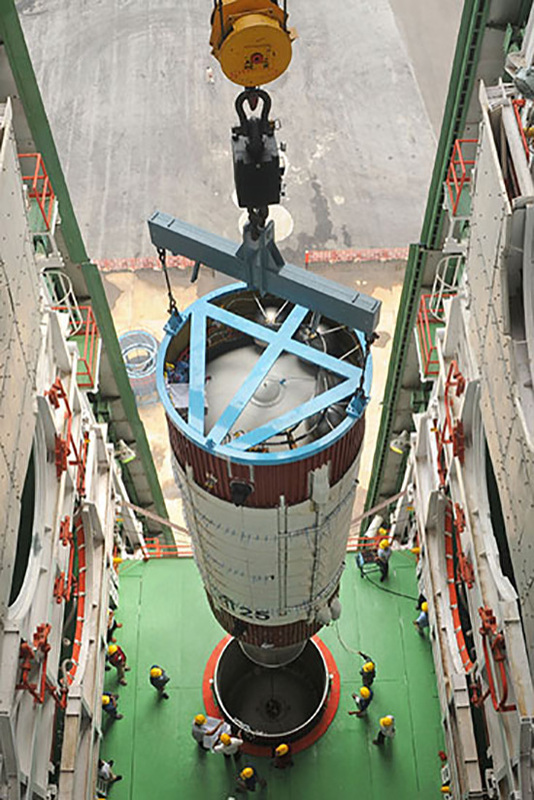 ‘Mangalyaan’ completed final prelaunch tests and rocket integration at ISRO’s Satish Dhawan Space Centre SHAR, Srihairkota on the east coast of Andhra Pradesh state following shipment from ISRO’s Bangalore assembly facility on Oct. 3. NASA is providing key communications and navigation support through the agency’s Deep Space Network (DSN). MOM’s science complement comprises includes the tri color Mars Color Camera to image the planet and its two moons, Phobos and Deimos; the Lyman Alpha Photometer to measure the abundance of hydrogen and deuterium and understand the planets water loss process; a Thermal Imaging Spectrometer to map surface composition and mineralogy, the MENCA mass spectrometer to analyze atmospheric composition, and the Methane Sensor for Mars to measure traces of potential atmospheric methane down to the ppm level. It will be of extremely great interest to compare any methane detection measurements from MOM to those ongoing from NASA’s Curiosity rover – which found ground level methane to be essentially nonexistent – and Europe’s planned 2016 ExoMarsTrace Gas Orbiter. 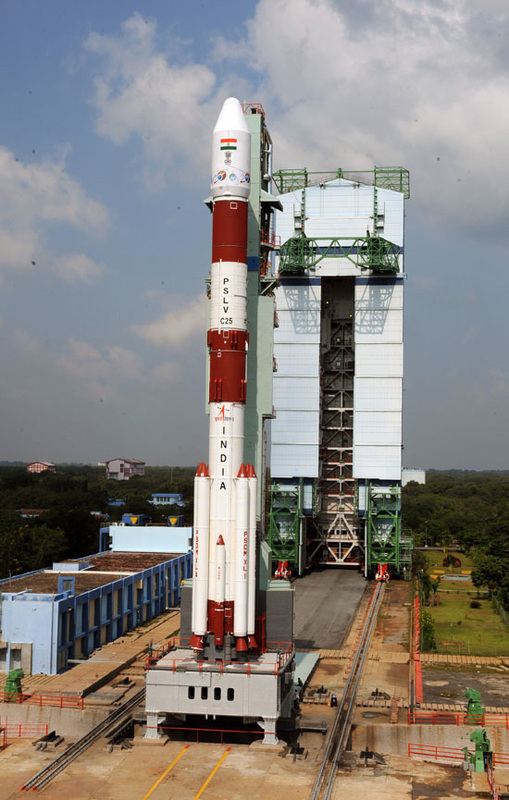 The 44 meter (144 ft) PSLV will launch MOM into an initially elliptical Earth parking orbit of 248 km x 23,000 km. A series of six orbit raising burns will eventually dispatch MOM on a trajectory to Mars around late November. Following a 300 day interplanetary cruise phase, the do or die orbital insertion engine will fire on September 21, 2014 and place MOM into an 377 km x 80,000 km elliptical orbit. It arrives about the same time as NASA’s MAVEN orbiter. The $69 million ‘Mangalyaan’ mission is expected to continue gathering measurements at Mars for at least six months and perhaps ten months or even longer.